Tiasha: I am very annoyed. Aakaash: That’s your job, Tiasha. Good that you are doing it well. Tiasha: And I am very serious. Aakaash: When are you not! Tiasha: Argh! I hate you, Aakaash. Aakaash: Thank God for small mercies! Just like a scoop of vanilla ice cream makes the sizzling chocolate brownie delicious, these best friends complimented each other. A chef by passion, Tiasha jumps and waves through her professional choices, while Aakaash, the witty stand-up comedian, knows exactly what he wants. He was the tranquility which refugees crave to stay in and she was the refugee, who wanted to wander and explore. 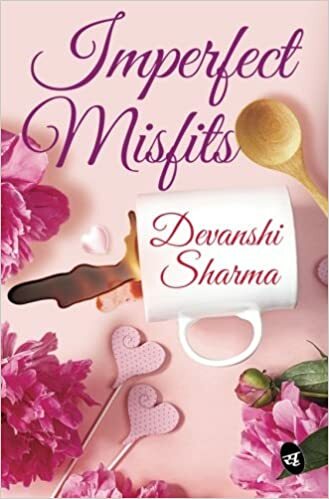 Imperfect Misfits is a story of perfect misfits, food, frolic, emotions and their endless imperfections. The question is, will their friendship survive through this wavy journey of love? To be summed up can be put up as a book which is an enjoyable read with you traversing in their story along with them. The cover is simple yet suits the story and the title as well. The title is intriguing and the back cover shows up the mutual understanding between them. The book has the story of Tiasha and Aakash as two poles apart kind of personalities but stay together no matter what as they know and understand each other more than anyone. The story follows the pattern of their description how they are towards the end of college and now they have to decide what to do with their lives to move on forward and again. Aakash is a standup comedian and Tiasha is an amazing cook. Life throws them with opportunities and they stay together as friends. Time passes by and they realize they are meant for each othher. The story has been narrated well and keeps the reader hooked with the storyline. Tiasha is a bubbly person who does’nt know what to do and is very unclear whereas Aakash is a person who is clear about what he wants in his life. The way the author has described the events is good it feels like a story being told with some of her sayings in between as well. Hinglish is used in the book. The funny conversations between both of them are really enjoyable. The language is easy to understand. A One time read to make you laugh and enjoy the simple yet good read.